The feature lead that burnt the fingers of oil interests secretly sizing up the Great Barrier Reef and embarrassed the government agencies involved. Australia is set to face a conservation battle of epic proportions as the oil industry and government resources departments push for the exploration and development of oil reserves off the Queensland coast. The Weekend Australian today reveals how 20 years of secretive seismic and drilling programs by international oil companies, research institutions and Australian government agencies have mapped out a potential petroleum and gas resource greater than the Gippsland Basin (Bass Strait) or Timor oil fields. A Queensland ministerial briefing early last year stated that “The presence of large petroleum traps suggests the possibility that the basin could contain over 5 billion barrels of oil, compared to the 3.97 billion barrels in the Gippsland Basin”. “We are interested in exploring near the reef only if society found it politically, socially and environmentally acceptable,” said Woodside Public Issues Manager Mr Robert Millhouse. Meanwhile with international seismic survey firm TGS Nopec now awaiting guidelines for the environmental impact assessment of its proposal to explore the Townsville Trough, a company spokesperson has denied that the company has any assurances from the Federal government over the future release of the area for oil exploration. A spokesperson for Federal Industry, Tourism and Resources Minister Ian Macfarlane also said no commitments had been made to the company and Queensland would be responsible for issuing any Special Prospecting Licence. A Queensland government spokesperson said no licence would be issued to TGS Nopec, regardless of any Commonweatlth decisions. Federal government documents released through the Senate show a series of mainly government seismic survey expeditions to waters in and around the Great Barrier Reef . Two resource agency voyages – on the RV Rig Seismic – were originally proposed to examine “petroleum play concepts” but later dressed up as regional geology evaluations which could help with reef management. The Great Barrier Reef Marine Park Authority issued a permit for the initial 1985 voyage of the RV Rig Seismic after seeking assurances that a project run out of the Fossil Fuels program of the Bureau of Mineral Resources had nothing to do with petroleum exploration. Australian Democrat environment spokesperson Senator Andrew Bartlett is predicting fierce conservationist opposition to any moves to open areas off the reef up to oil exploration. “We’ve had 20 years of government agencies using science in the same way the Japanese whaling industry uses science – as a cover for what they are really up to,” he said. Out of the original battles against mining and drilling on the Great Barrier Reef thirty years ago came much of Australia’s conservation movement – and a string of government policy commitments and legislative bans to keep the world’s oil industry away from the reef. But the suspicion that out there among the coral reefs there lies a Lasseter’s Reef of oil has meant the search went on - conducted in secret or conducted in the name of science and largely conducted by agencies of the same Federal government charged with protecting the reef. With the aid of a swag of documents – demanded from the Federal government by the Senate and obtained from the Queensland government through repeated recourse to its highly deficient Freedom of Information laws – the Weekend Australian is able to detail how the search for oil went on, despite the mining and exploration bans that began to be applied to the Great Barrier Reef Marine Park in the late 1970s. Since then at least seven seismic or drilling expeditions producing information of significant interest to the oil industry have probed the seabed in and around the Great Barrier Reef. One of these expeditions is known to have restricted its probing to outside the marine park boundaries and four are now known to have done at least some of their probing on the reef itself. Lasseter’s Reef may have been found in the form of the Townsville Trough – the possibility of more oil than Bass Strait in an ancient sedimentary basin that starts under the Great Barrier Reef and pokes out between the pristine and partly protected Lihou Reef and Marion Reef formations in the Coral Sea. The game is now about to change, as secretive government and research institute mapping of geology and resource potential proceeds to full commercial exploration, a development certain to be opposed by conservationists and very likely other industries like tourism and fishing. “This one (the Townsville Trough) ranks with the best in terms of prospectivity and when geologists look at that they get excited,” said Woodside Petroleum Public Issues Manager Mr Robert Millhouse. “We acknowledge the difficulties and the sensitivities. If the government makes a decision, as an Australian explorer we would like to be there”. Australian Democrats Environment spokesperson Senator Andrew Bartlett, said the Australian community would not accept oil exploration and drilling on or near the reef and for the government and industry to press on “will mean a replay of our first big national conservation battle”. Global seismic survey company TGS Nopec staked the first claim on the Townsville Trough with a late 2000 bid to have a survey ship booming away over the Townsville Trough by May last year – only to have the project called in under Federal environment legislation. Any day now, Federal Environment Minister David Kemp is due to hand down for public comment his draft guidelines for Environmental Impact Assessment of the TGS Nopec proposal. The company has denied as “absolute rubbish” a claim by a former Queensland government official that in briefing State officers they gave the impression they had “a nod and a wink” from Federal resources bureaucrats for the release of exploration acreage in the Townsville Basin. But in internal Queensland government briefing papers, a number of officials of both the Environment Protection Agency and the then Mines and Energy department relate that the company will not be proceeding with the application without some “comfort” from the Federal Government “that the area would be later released for petroleum exploration, including drilling”. A spokesperson for TGS Nopec said the company had no explanation for these references, saying it would be re-assessing its application on the basis of the environmental impact assessment guidelines. A spokesperson for Federal Industry, Tourism and Resources Minister Ian MacFarlane said there had been one meeting only, between company representatives and departmental officers. The issue of a Special Prospecting Licence was a matter for Queensland authorities, and “no commitments” were made on the release of exploration acreage. “Geophysical contractors sometimes speculate on such surveys, in the hope that they can later sell the information to a number of exploration companies,” the spokesperson said. A spokesperson for the Queensland Natural Resources and Mining Minister, Mr Stephen Robertson, said that regardless of the Federal government’s eventual decision on environmental impacts, the Queensland government would not be issuing the company with the necessary Special Prospecting Authority. But Queensland government officials also noted that “it is well known that Woodside (Petroleum) is considering exploration options near the Great Barrier Reef”. Mr Millhouse said Woodside had studied the Great Barrier Reef region data collected by government agencies “that all companies can access”, but the company was “not agitating” for the area to be opened up. The oil and exploration companies looking offshore from Queensland are looking at maps thick with seismic lines laid out by the Bureau of Mineral Resources (BMR) or its successor the Australian Geological Survey Office (AGSO). Members of the public checking the seismic output of these agencies since the 1960s on the new interactive website of Geosciences Australia see only a complete blank off the coast of Queensland. In 1998, the then Federal Resources Minister Senator Warwick Parer also told a Senate estimates committee there had been no seismic exploration of the reef since the 1960s. He couldn’t have been more wrong. Ampol, poised to begin drilling near the Whitsundays, backed off in the face of adverse public opinion in January 1970. A Commonwealth/State Royal Commission into drilling on the reef was announced within weeks and was just getting going when the oil tanker Oceanic Grandeur grounded in the Torres Strait in the first major oil spill incident on the reef. Exploration activity slowed but apparently did not stop with the Royal Commission in progress. The then Bureau of Mineral Resources (BMR) sent a vessel to the Townsville Trough in 1971. Oil multinational Shell was active in the same area in 1973 and 1974 – apparently with an agreement that they could keep anything discovered confidential for a period of seven years - even from the government. The Royal Commission, one of the most leisurely such enterprises ever conducted in Australia, reported its failure to reach a conclusion in October 1974. The two technical commissioners opted for drilling close to reefs with safeguards, chaiman Sir Gordon Wallace opted for a moratorium on all drilling in the reef region until the results of short and long term research was known. The government response was typically confused. The Whitlam government’s Great Barrier Reef Marine Park Act prohibited mining and exploration in areas declared as marine park. The first marine park area - Capricornia - was established in 1979 but much of the reef was to remain under mining and exploration leases until the 1990s. The Fraser government formally accepted the no drilling recommendations of just the chairman of the Royal Commission in 1979. The Hawke government prohibited oil drilling in areas of the region not declared as Marine Park soon after coming to power in 1983. Houston–based Geophysical Service International (GSI) sailed the MV Eugene McDermott into this regulatory confusion in 1979, and again in 1984. The company sought the Shell provisions for confidentiality on anything they discovered, but achieved only a five year ban on general release and no ability to keep secrets from the government. In the original permit application, GSI stated they did not intend to go into the reef region. With the voyage under way however, the Commonwealth was advised that the “initial participators in this investigation” - Esso, Santos, Phillips Petroleum , BP and the Italian AGIP SPA – now wished to poke a few seismic lines into proposed marine park areas. BMR had no objections, but did its best to offload the whole issue onto the Department of Science and the Environment when the issue of the MV Eugene McDermott nearing the reef blew up in Parliament. GSI and its “participants” soon announced they had dropped the reef program and the government announced it would not be allowing any further oil exploration in the Great Barrier Reef region. GSI was not in any hurry to provide the Bureau of Mineral Resources with the results of its surveys, but as the reports dribbled back after repeated requests to Houston they seem to have caused some excitement. The Fraser government opened the Coral Sea to exploration in 1981, with the minister saying “no commitment will be given to issue exploration permits within 30 miles of the reef” but there were no such guarantees in the legislation. At that time, the BMR was in the process of outfitting its own expedition to the reef region, in the entirely appropriately named RV Rig Seismic. Internal BMR correspondence on this cruise is reasonably specific - it was to look at “resource potential” under the BMR’s Fossil Fuels Program and they intended to do some of that looking inside the Great Barrier Reef Marine Park. This apparently sounded too much like oil exploration for the Great Barrier Reef Marine Park Authority (GBRMPA). The paper trail is sketchy – reference is made to a number of urgent telephone calls relating to GBRMPA’s “difficulties with your description of project”. A permit was ultimately issued for the scientific purposes of looking for “a possible rift basin, depositional history and heat flow regime”. These are all scientific purposes that relate to the possibility of oil being found in an area. Enclosing the GBRMPA permit, deputy chief reef guardian Dr Richard Kenchington wrote to BMR: “It would be appreciated if you could write to us and (the Australian Marine Science and Technical Advisory Committee) formally advising that the aims of the proposed project are purely scientific and not involved with petroleum exploration.” This letter to AMSTAC should have appeared in the supposedly exhaustive document search ordered by the Senate, but seems to have been one of a number of documents not found or not produced. Or else, never written. Kenchington also told BMR that there were “potential problems” with the project being associated with the fossil fuels program saying “It would also be appreciated if this problem could be taken into account for future descriptions and publication of your research”. This seems to have achieved little more than to get Federal resources bureaucrats looking for a new line in justifying their research activities. In the margin of one of the documents is the handwritten suggestion that the research can be portrayed as helping to assist GBRMPA to manage the reef. The RV Rig Seismic took another “scientific” cruise to the Whitsundays area in 1988. To their proposed program, they added some “tie-in” work to two earlier petroleum exploration wells in the vicinity of the noted Swains reef at the request of the Queensland government. A Dutch scientist who had earlier written that he was “confident the dirty past of your reefs will soon be explored by the drill” was recruited for the trip. Government agencies have been surprisingly reticent about the assorted cruises of the RV Rig Seismic. AGSO, furnishing a list of seismic voyages to the reef in response to a Parliamentary Library query on behalf of the Australian Democrats seems to have quite forgotten the assorted voyages of its own vessel. When the total absence of seismic plots off the Queensland coast on the interactive website detailing government agency seismic output since the 1960s was raised with the office of Federal Resources Minister Ian Macfarlane, the explanation was that the data had not yet been supplied by Queensland. Why the AGSO website needed Queensland to supply the data from AGSO expeditions was not entirely clear, but it was further explained that “Geoscience Australia’s priority in this development is determined by demand from its clients and client demand in this region is negligible”. Interestingly, Queensland sourced documents note that when Woodside sought data on the Great Barrier Reef in May 2000 they “were referred to the Commonwealth”. Queensland bureaucrats reviewed the mass of seismic lines from Commonwealth agencies included in documentation from TGS Nopec – and themselves immediately resolved to seek further and better particulars from the Commonwealth. The Australian Petroleum Production and Exploration Association seems to have had quite prompt and specific knowledge of the results of the RV Rig Seismic cruises. Then director Keith Orchison told the June 1990 APPEA conference that BMR estimated there was between 300 million and one billion barrels of oil on the north eastern areas of the continental shelf . Brand new Labor resources minister, Alan Griffiths, followed up this speech by announcing a timetable for the full exploration within 10 years of offshore areas including the Queensland and Townsville Troughs and the Capricorn Basin. Although these features intruded under the reef, Griffiths said the program had been ticked off by GBRMPA and there was to be no drilling in the marine park. All hell broke loose. Environment minister Ros Kelly said she had found out about the offshore oil search strategy reading the newspapers and GBRMPA chair Dr Graham Kelleher said the authority had only recently been presented with a fait accompli. Prime Minister Hawke stepped in to say that no exploration activities would be allowed to ‘harm the reef. Griffiths seems to have been dropped into it by his department. However, he may have learned from this humiliation. Two years later one of his advisers roasted BMR over a presentation on the NE Australian continental shelf to the International American Association of Petroleum Geologists, taking particular exception to an invitation for “interested explorers” to come forward. Instead, BMR presenters were required to state, both before and after their presentations, that their studies were “not designed to assist or encourage petroleum exploration in the areas under discussion, but rather to investigate regional geology and the evolution of the continential margin”. Presenters also had to say, again both before and after, that: “I have been asked to stress that the Government has no intention whatsoever of releasing areas immediately adjacent to the Park for exploration now, or in the foreseeable future”. The world wide Ocean Drilling Program, supported by an array of governments and universities, undoubtedly has a large component of pure disinterested science. It is not the purpose of the program to drill for oil, indeed its equipment is unsuited to this purpose. But drilling for oil geology may be another matter entirely. Repeated questions have been raised about ODP and oil industry connections. The program is based at the Texas A&M University in Houston, not on any coastline but also the home of the Global Petroleum Research Institute and the recipient of much largesse from the oil industry. Oil industry scientists are present on at least some voyages, and equipment is tested on behalf of oil industry bodies. The Australian partners to the program consider that “ODP is basic research, with some aspects approaching strategic research for petroleum and minerals industries”. The ODP has twice sailed into the Great Barrier Reef with the former oil drilling ship Joides Resolution, causing some excitement in the oil industry with whatever it was that was discovered in its 1990 excursion. Some clues come from an internal government evaluation of Australia’s involvement, which noted that “Leg 133 drilled deep holes in the Queensland and Townsville Troughs, both of which are considered to be prospective for petroleum.” The results were described as “highly significant for both AGSO and the petroleum exploration industry”. The Joides Resolution came back last year, armed with a permit from GBRMPA to drill at least 16 significant deep core samples inside the reef boundary. Although the program indicated a willingness to undergo the public consultation often required for the issue of such permits, Australian authorities waived the requirement. The reef wasn’t exactly kind to the Joides Resolution – operations at site 1193 were unsuccessful after dramas involving several broken drills, a “bent pipe event”, collapsed inner tubes, a lost beacon and a necessity to blast the pipe clear of one hole with explosives. A “roughneck who was diagnosed with possible kidney stones” had to be helicoptered to Mackay, followed three days later by another medical evacuation for a scientist with a broken leg. The second helicopter was, however, able to bring back the roughneck..
On their original timetable, the Norwegian based TGS Nopec planned to be busily engaged from May 2001 in detailed commercial surveys of all areas of the Townsville Trough more than 50 kilometres seawards of the Great Barrier Reef Marine Park boundary..
That proposal has been held up while its environmental impacts are considered. But, as briefing notes to the Queensland minister for Natural Resources and Mines make clear, it “should not be considered a one-off request”. There would appear to be some significant gaps in the documentation acquired by The Weekend Australian? In 1998, former Queensland Mines and Energy Minister Tom Gilmore confirmed that he had headed off at the pass a move by his own department to advertise for expressions of interest in “oil and gas appraisal” in the Townsville Trough and the Capricorn Basin, largely under the reef. This move appears to have produced an extraordinarily slight volume of documents in the form of references to letters rather than the letters themselves. Repeated requests under Queensland FOI finally produced the response that an officer “no longer an employee of the department may have been called back to work one Sunday (he does not recall the date) to provide then Minister Tom Gilmore with a verbal briefing . . . this briefing may have touched on exploration opportunities in or near the Great Barrier Reef, but the details of that proposal may have been confused with other developments. . . . (the department) believes that no record was kept of this meeting”. At about the relevant time – September 1997 - a senior Federal bureaucrat was briefing Federal Resources minister Senator Warwick Parer that “a number of large international oil and gas company representatives have shown interest in exploring for petroleum in waters offshore of Queensland”. Asked later in Senate Estimates whether any international companies were sniffing around the Townsville Trough, Senator Parer said “Not to my knowledge.”. Lists of seismic and drilling voyages to reef and near reef waters have now been provided in response to parliamentary orders, parliamentary library queries and The Weekend Australian’s questions. The number of discovered voyages appears to be on the increase with each successive query. The person more responsible than any other for both the emotion and the deep suspicion about drilling on the reef – and also very probably for the legal prohibitions on exploration and extraction - is former Queensland Premier Sir Joh Bjelke-Petersen. Oil and fossil reefs often go together – but when the reefs and coasts of California were decimated by an oil blow-out in 1969, national sentiment began to swing against allowing drilling on the Great Barrier Reef. New Queensland Premier Joh Bjelke-Petersen said he would be honoring all existing contracts on the reef. It was later revealed that Bjelke-Petersen had substantial interests in two companies that had, within weeks of his becoming premier, been given significant oil prospecting rights on the reef. The national campaign against oil drilling and limestone mining on the Great Barrier Reef was the first of the major conservation campaigns and played a major role in the formation of the Australian Conservation Foundation. Bjelke-Petersen was to continue advocating drilling on the reef well into the 1980s. 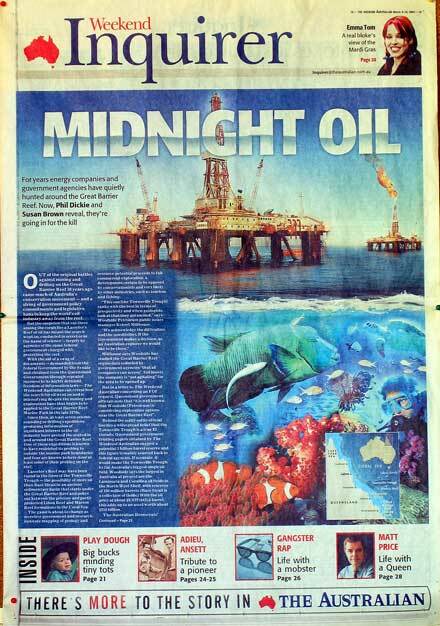 This feature, which led the Inquirer section of The Weekend Australian, in March 2002, was the result of a lengthy investigation of 30 years of secret activity by oil companies and government agencies in defiance of the long standing ban of exploration on the reef. The article was a major embarrassment to the Australian government and an exploration company subsequently withdrew an application for seismic testing in a basin extending into the reef area. There were follow up articles on ABC TV, the major metropolitan and regional press. It also provided impetus to an ABC Four Corners program on threats to the Great Barrier Reef. Co-author Susan Brown was extensively interviewed for this program.